On July 20, a series of activities of Experience China 2017- Cultural Exploration of West China in the UK were kicked off in London. 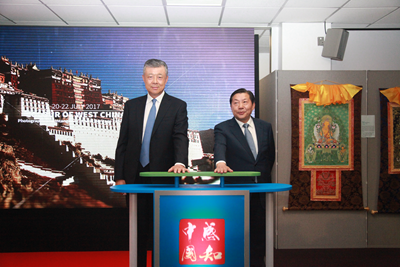 Lu Wei, Vice Minister of the Publicity Department of the Communist Party of China and Ambassador Liu Xiaoming attended and addressed the opening ceremony. Nearly 600 guests from all walks of life in the UK attended the ceremony and the cultural events. Vice Minister Lu said in his speech that both China and the UK are important representatives of the Eastern and Western civilizations. The cultural exchanges between the two countries have continued for hundreds of years, playing an important role in promoting mutual understanding between the two peoples. West China lying in the heart of the Silk Road has been a land bridge connecting the east and west since ancient times, where different civilizations met, clashed and intermingled with each other. Many ethnic groups who settled in West China have created a variety of cultures and arts. Experience China 2017 in the UK is designed to enable the British people to appreciate China's multinational culture and understand China as a unified multi-ethnic country with diverse cultures, so as to enhance the mutual understanding and friendship between the peoples and boost a more sustained and stable "Golden Era" of China-UK relations. 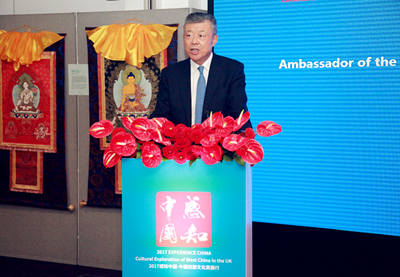 In his speech, Ambassador Liu pointed out that the western region of China is regarded as a fount of culture thanks to its unique and rich variety of ethnic cultural heritage. This event focuses on exploring the cultural heritage of west China. The colorful composition of the event will bring the vast west of China to the door steps of Britain, which will allow the British audience to enjoy the natural beauty, historical sites and places of interest in west China and to learn and experience China from a close range. Ambassador Liu said that British friends who have been to the more advanced coastal regions in the east might not know a lot about China's west. Therefore, Experience China 2017 could not have come to Britain at a better time. In recent years, the west China has achieved fast growth relying on its late-mover advantage. Major development indicators of the western region have been higher than the national average. From 2013 to 2016, the GDP of the western provinces and regions grew by 9.1% annually, which was close to two percentage points higher than the national average. The economic structure has been optimized with the fast development of strategic emerging industries, including new energy vehicles, IT and big data. Recent years have witnessed fast development of cultural and creative industry in west China, overtaking that of the eastern region in 2016 in both output and revenue. After years of efforts, China's west has achieved leapfrog progress in economic, social and cultural development. It is now taking on a brand new look. 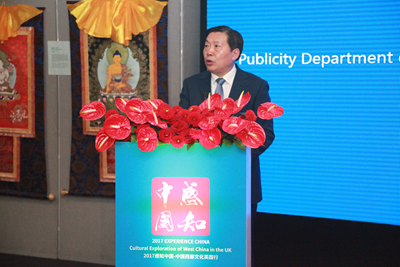 Ambassador Liu is convinced that the launch of the Experience China 2017 in the UK being a part of the efforts to advance China-UK "Golden Era" will help form stronger people-to-people bond, enhance mutual understanding on the Belt and Road building, and contribute to the broad exchange and mutual learning between the Eastern and Western civilizations. He stressed that, on the basis of the shared commitment to building the China-UK "Golden Era" reaffirmed by President Xi Jinping and Prime Minister Theresa May, China looks forward to working with British friends from all sectors for closer exchange and collaboration, and for deeper understanding and trust. He is confident that through concerted efforts by both sides, the mutual learning can be advanced between the Eastern and Western civilizations, and China-UK relations will bear more "golden fruits" in the "Golden Era". After the ceremony, the guests viewed the "Colorful West China" photo exhibition which highlights the intangible cultural heritage of west China. 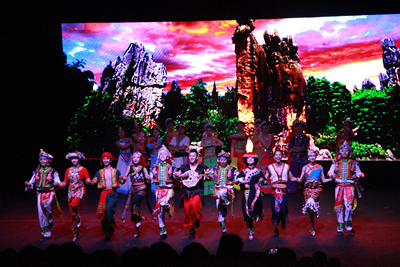 They also enjoyed "Dancing in the Clouds", a folk singing and dancing performance from west China. Experience China - Cultural Exploration of West China is a cultural brand designed by the Information Office of the State Council. Experience China 2017 is co-hosted by the Information Office of the State Council and the Chinese Embassy in the UK. 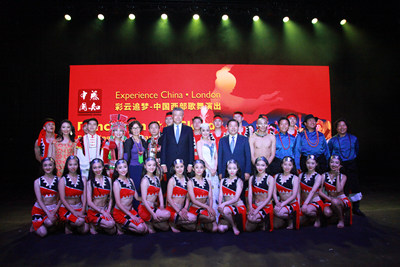 A series of activities showcasing the culture of west China in the forms of folk singing and dancing, photo exhibition, films and book show, and expert exchange were held in London from July 20 to 22. This event later toured Edinburgh and Manchester. Vice Minister Lu, Ambassador Liu and his wife with artists of "Dancing in the Clouds"